The young poet fixed his eyes earnestly on her face for some time in silence, then slowly turning round left the house and walked towards a small grove of trees just opposite. There he stood for a few moments resting against a tree, and facing the house as if to take one more vengeful or admiring glance, then went his way without once turning round. The young girl had been watching him from the window, and the moment he moved she passed out of the door like one in a dream, and followed him slowly, step by step, down the avenue. 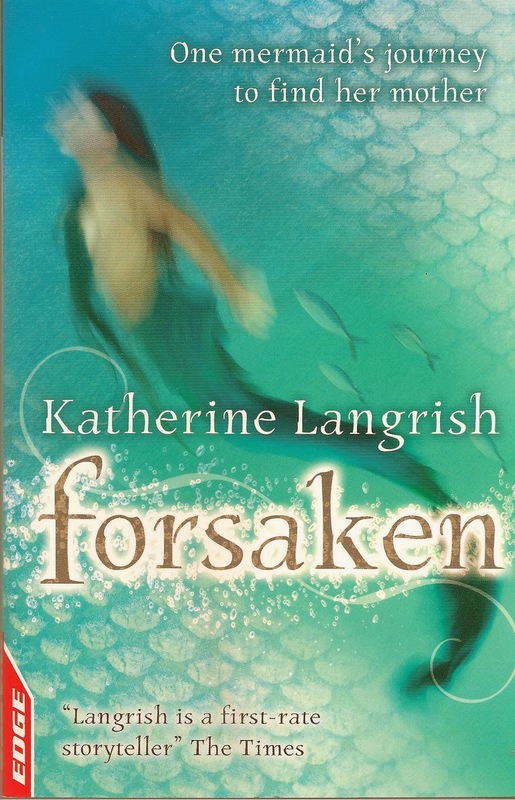 …and seeing the whole family in pursuit, quickened his pace, first glancing fixedly at the girl for a moment. Immediately she sprang towards him, and they were both almost out of sight, when one of the maids espied a piece of paper tied to a branch of the tree where the poet had rested. From curiosity she took it down, and the moment the knot was untied, the farmer’s daughter suddenly stopped, became quite still, and when her father came up she allowed him to lead her back to the house. 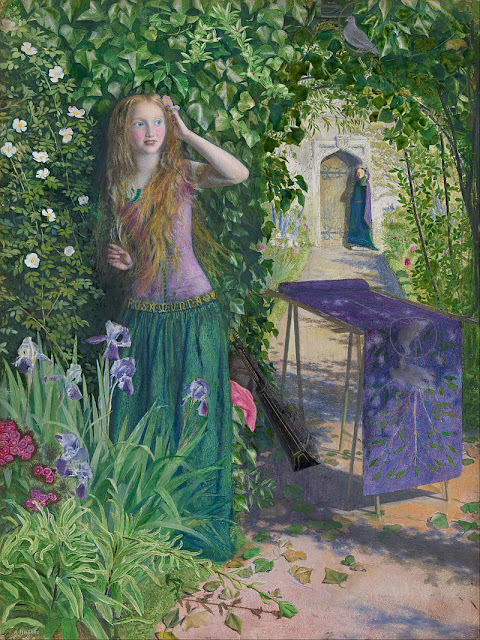 Recovering, the girl tells her family how she’d felt impelled to follow the young man ‘wherever he might lead’, only coming to her senses when the spell was broken. But what was the spell? 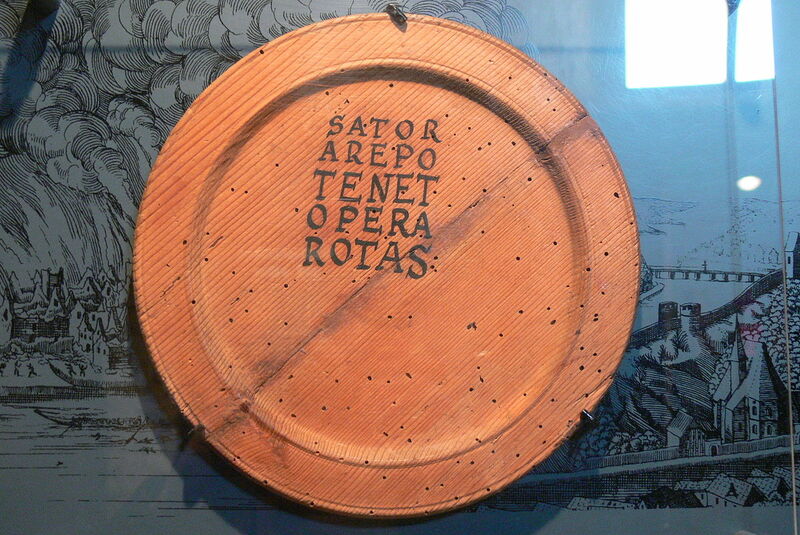 The Sator, Rotas, or Rotas Sator Square as this acrostic is called, is both very old and tantalisingly obscure; at any rate, no one has yet succeeded in explaining to everyone else’s satisfaction exactly what it means. Carved in stone or painted on walls, it crops up all over the place, at sites in Italy, Britain, Sweden and even Syria, ranging in date from Roman to medieval to near-modern. 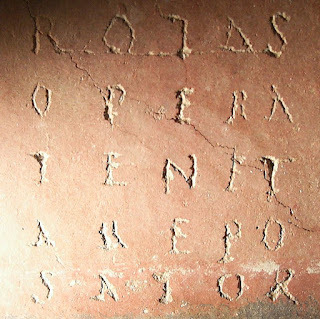 The words are obscure in themselves and have given rise to various tortuous interpretations (explored in this interesting article by Duncan Fishwick MA, "An Early Christian Cryptogram? "), which range from the reassuringly rural though still opaque, ‘The sower Arepo works the wheels with care’ – to Satanic invocations. 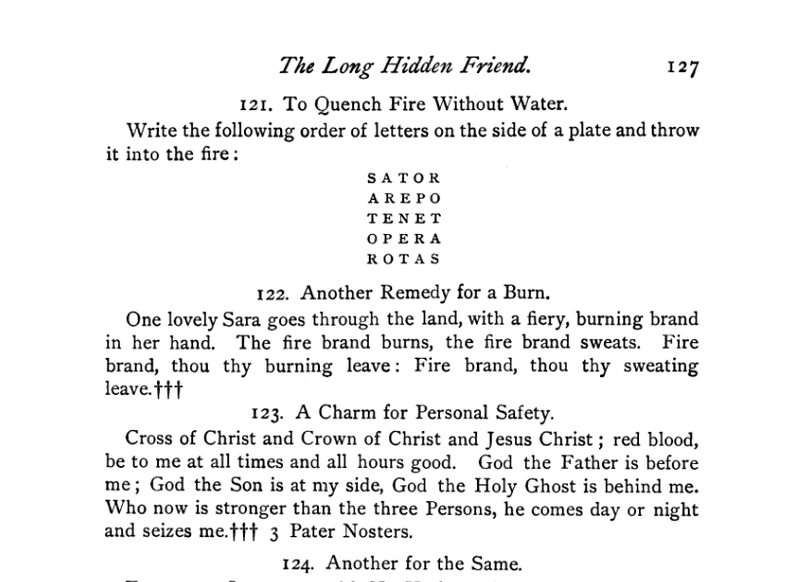 AREPO is a nonsense word, and it seems that the rest, though they may resemble Latin words, are so ungrammatical as to be pretty much nonsense too. However, back in the 1920s two German scholars discovered (or re-discovered) that the Square hides an anagram: it can be arranged as the word PATERNOSTER written twice in a cruciform order which uses the N only once, and leaves four letters over: two As and two Os – Alpha and Omega. There’s really no chance that this is not deliberate, but to assume a Christian solution is problematic. 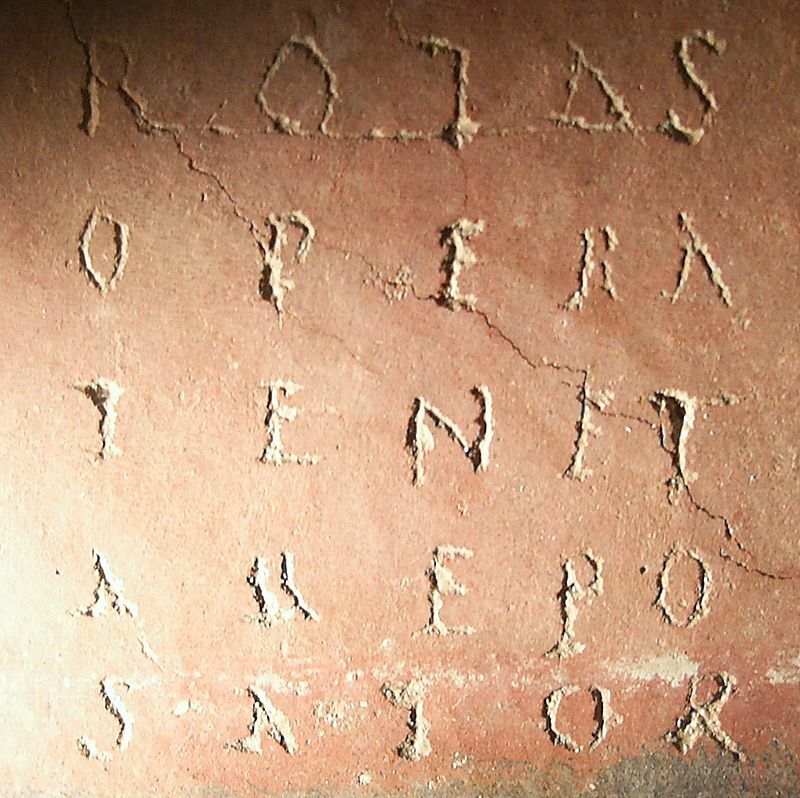 The earliest known examples of the SATOR square are two graffiti from Pompeii which predate the Vesuvian eruption of AD 79. Duncan Fishwick summarises the difficulties thus: there's no convincing evidence of any Christians in Pompeii before it was destroyed; the Cross is not found as a Christian symbol before about AD 130; Christians of the First Century used Greek not Latin for teaching and liturgy; the Christian use of Alpha and Omega as symbols for God was inspired by verses of the Apocalypse, which by AD 79 had not yet been written; finally, ‘cryptic’ Christian symbols first appear only ‘during the persecutions of the third century’ when overt Christianity had become politically unsafe. There was however a Jewish population in and around Pompeii, as various graffiti testify, and Fishwick suggests that rather than Christian, the Sator Square may have been Jewish in origin. 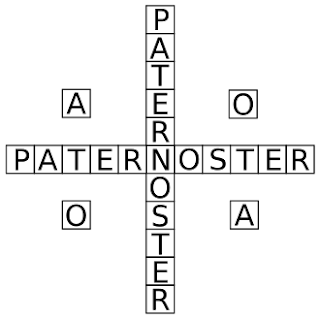 The Alpha and Omega may derive their significance from Old Testament passages such as Isaiah 44, 6 in which God declares, ‘I am the first and the last’, while as for the Paternoster anagram, Fishwick explains that, ‘Far from being a Christian innovation this form of address [eg: 'Our Father'] has its roots in Judaism’, citing various Judaic prayers. He concludes that the Square may likely have been a charm constructed by Latin-speaking Jews, the magic of which resides in its satisfying symmetry and the concealed invocation which, revolving around the single letter N, hints at the unspoken nomen or name of God. 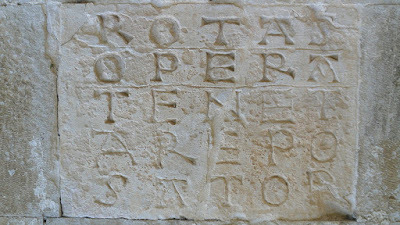 Another scholar, Rebecca Benefiel, points out in a fascinating article, "Magic Squares, Alphabet Jumbles, Riddles and more: The culture of word-games among the graffiti of Pompeii," that the Sator Square is only one of many different word-squares found at Pompeii. Even if not Christian in origin, the Square was soon adopted as a Christian charm and invested with more specifically Christian symbolism: a belief arose that the five 'words' of the palindrome were the names of the five nails which fastened Christ to the cross. And it went on from there to enjoy a long subsequent history as a potent magical spell. It was used in the 12th century, according to medieval scholar Monica Green (quoted by Sarah E. Bond in a post, 'Power of the Palindrome', in her blog History from Below), as a charm which could be written on butter and eaten, to help women who had miscarried. At some time in the 18th century the Sator Square was brought from Germany to America: in the Pennsylvanian Dutch example shown below, dated circa 1790, you can see that mistakes have been made in the lettering, so that it becomes simply a piece of magical gibberish. 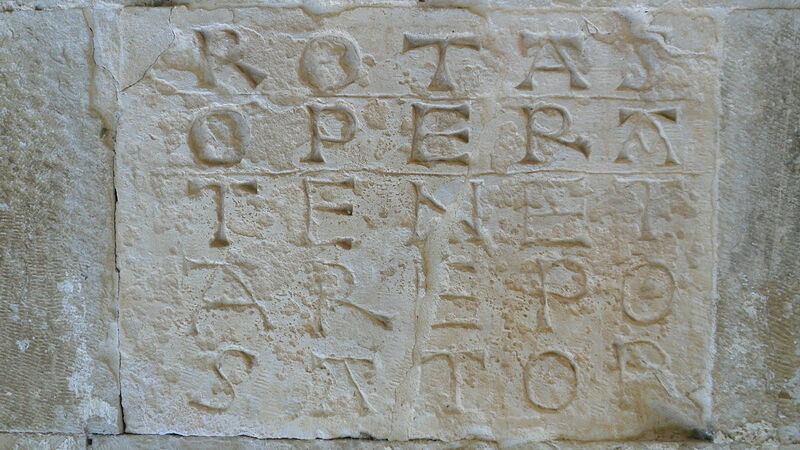 One wonders how early any awareness of the Paternoster anagram had vanished. 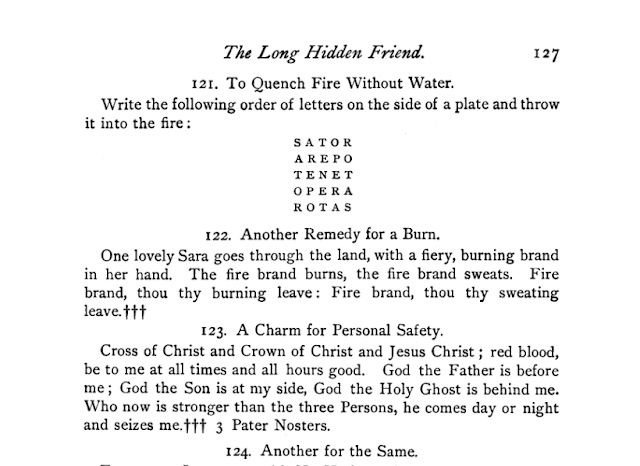 In fact 'The Long-Hidden Friend' itself had a long history as a popular folk-magic text: as late as 1904, Carlton F. Brown wrote in The Journal of American Folk-lore (Vol. 17, No. 65, Apr. - Jun., 1904, pp 89-152) that 'in eastern Pennsylvania whole communities, even whole counties, firmly believe in the realities of "hexing", and protect themselves from its influence by the charms and incantations of witch doctors.' Subsequent investigation by the Berks County Medical Society into the practices of the witch doctors showed that 'the principal source of the charms which they were using was this very book of Hohman's.' And they charged high prices for their services. 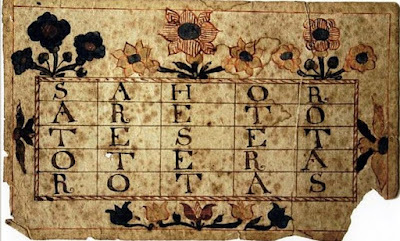 Who would have thought that a word puzzle dating from at least as early as first century Pompeii would still be in use as a popular charm in 19th century America, and appear in a 19th century Irish folk tale? 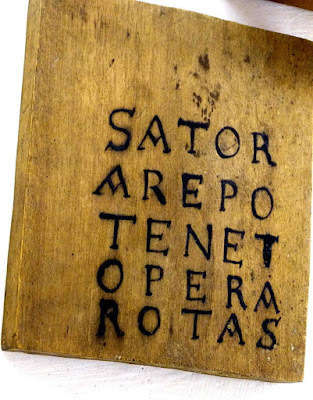 Whether Judaic or Christian, Roman or medieval, European or American – whether religious symbol, magical aid for women in childbirth, a charm to put out fires or a spell to lure young Irishwomen away – the Sator Square will surely continue to puzzle and intrigue. Thanks for such a long and interesting comment: that link is fascinating, I'd love to read the original paper! I also love your idea about the lines from Isaiah. ( Heading off to read them now!) HAve you come across Elizabeth Wayland Barber's book 'When They Severed Earth From Sky'? 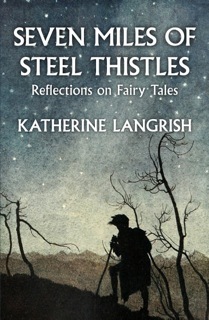 It's all about this kind of thing, historic and prehistoric events 'recorded' in folk lore. Whether she's right about all of it I don't know, but it's a brilliant and thought-provoking read.